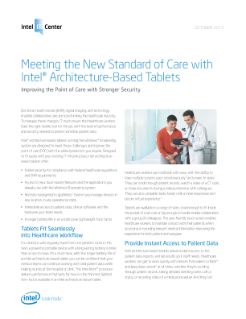 Find out how Intel® architecture-based tablets in healthcare IT are meeting the new standard of care with stronger security and the ability to fit seamlessly into existing workflows. With Intel®-based tablets running the Windows* 8 operating system, healthcare workers can gain immediate access to the data they need in an unobtrusive, ...lightweight form factor that offers a longer battery life. Added security offers powerful protection for electronic medical records to help prevent data breaches and preserve compliance, and remote management tools give you greater control over the mobile devices in your healthcare organization. Read the full Tablets in Healthcare IT: Transforming the Point of Care Brief. A look at today’s mobile workforce.